You know how you always mean to start something and never get around to it? For me, it’s working out. I’m sure you have at least one thing that niggles at you all the time because you keep meaning to do it and never actually start. That’s what today’s post is about . . . how to stop that problem with mini habits. I recently read a book called Mini Habits by Stephen Guise that changed the way we look at the things we do in life. Everyone knows that good habits are a great thing to develop, but seriously, who has the time to plan a workout every day for an hour or even 30 minutes? 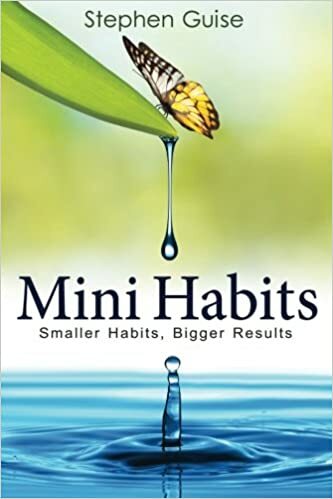 The book addresses this and challenges you to start with a mini habit. For example, if you want to start working out more often, you can decide that your habit will be just one pushup per day. A mini habit is basically a much smaller version of a new habit you want to form. 100 push-ups daily is minified into one push-up daily. Writing 3,000 words daily becomes writing 50 words daily. Thinking positively all the time becomes thinking two positive thoughts per day. It seems silly, doesn’t it? The idea of doing just a single pushup? But think about it. Would you rather start a 30 minute workout right now or do a single pushup? There’s no way to say you don’t have time for a pushup. You can’t decide that one pushup is just too hard. It’s a simple, easy thing that removes pretty much all obstacles to doing it. Once you’ve done one pushup, you’ve started, so it’s much easier to do a few more. This little amount can change your life. It has mine. Finances: You want to save $1,000 for a family vacation. It’s overwhelming, especially when you’re already on a tight budget. Mini Habit – Put your change into a jar at the end of each day. Easy, peasy. Sometimes you might want to toss in a little extra, even! Household: You desperately need to organize your bedroom, but there’s so much stuff! Mini Habit – Put one thing back in its place, on a daily basis. Bonus Mini Habit – Put one item of clothing that you no longer use into a donation bag each day. Children: Kids are begging for attention, but you really just want them to leave you alone. It’s frustrating for all involved! Mini Habit – Tickle those kiddos for one minute. They’ll be thrilled and can settle down a little and you will feel like a better mom. See how this works? You can create mini habits for every area of life, but the author is very specific in the book that you should focus on one thing at a time and for good reason. You can get overwhelmed by even little habits! Anyone can use this awesome concept, but you really need Mini Habits if you find yourself procrastinating on everything. If you feel that you just can’t start something because the thought of doing it all is just too much and too overwhelming, then you should definitely try mini habits. Moms who find themselves saying they can’t work out because their baby won’t let them do anything (trust me, I’ve been there! It’s rough!) can do mini habits. You can do just one thing. And the best part is that it gets easier and easier the more you do it. Eventually, your habit will become a habit for the whole family and that means you’ll have more time to do what you need to. Ready to try Mini Habits for yourself? Grab a copy of the book and get started today.